We’ve included some of them below and you can download the full report here. A 36% increase in funds available for PB - with Community Choices funds remaining the same as last year "this increase represents significant financial investment from local authorities as they move towards meeting the 1% target." There was a 20% decrease in the number of projects funded, but an increase in the funds - showing successful projects received larger pots of money. The number of voters increased by 46% - this reflects the use of digital, with 10 PB processes (6 public body, 4 community orgs) including digital voting element. Community organisations felt "that the time required to organise and host events had limited some group’s abilities to engage with harder to reach communities." Market Stalls were the most popular way of finding out about projects at community events. 13 projects reported the provision of childcare or children’s entertainment and activities at events to ensure events were family friendly. 11 projects provided free public transport to help those less mobile or socially isolated to attend events, although many projects report that it was not taken up. One project reported providing additional training to help build the skills and capacity of steering group members to ensure the inclusion of BME community members. A central way in which projects have been able to ensure social inclusion is through local community members design of the PB processes via steering/working groups. One local authority project highlighted the use of key staff across multiple departments and locations e.g. housing officer, libraries and community centres to promote the PB process. The National Standards for Community Engagement were found to be a useful tool for designing fully inclusive community events. Of the 17 local authorities funded through the 2017/18 Community Choices Fund, 14 provided information on planned future PB activity. 5 indicated that they would be working towards meeting the 1% mainstreaming target. One local authority noted that they would be working towards allocating £1 million pounds of local authority funding by developing their PB process in partnership with local agencies. One local authority (see case study on Dundee City Council) had used Community Choices Funding for support costs in 2017/18 to roll out the use of PB for £1.2 million. 6 community organisations reported that they would be engaging in further community engagement work based on their experiences hosting local PB events. 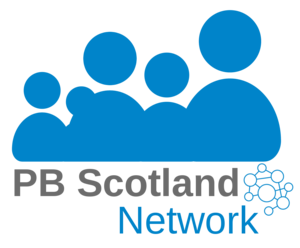 4 projects intended to continue promoting PB processes locally through working with local community planning partnerships or local authorities. 4 projects already had plans for future projects and a further three projects were looking to secure additional funding to continue their work around PB. 2 groups had already secured funding for further PB activity. Many projects indicated that as a result of PB activity new forums for participatory engagement had been established. For more information contact community.empowerment@gov.scot.